Women's Army Corps reserve, 1958. Caption slip reads: "Photographer: Chernus. Date: 1958-01-12. Reporter: Chernus. 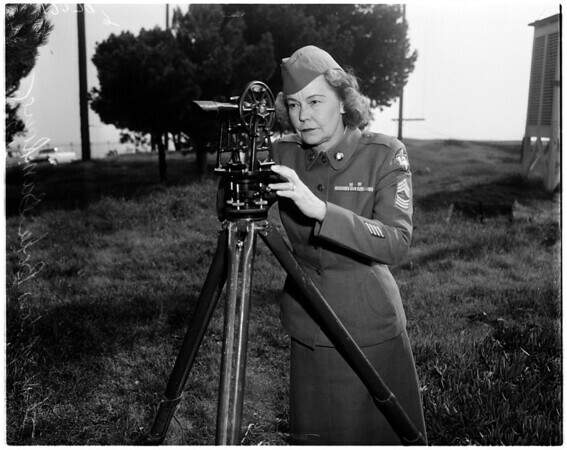 1 neg shows Staff Sergeant Lois Baker Barnhouse, 33, looking through transit. She is only WAC reserve serving in 409th Engineers Brigade Reserve, during training at Fort MacArthur. Believed to be only WAC reserve member of Engineer outfit. 1 neg -- shows Staff Sergeant Lois Baker Barnhouse looking through transit while Warrant Officer Allan Dutton looks on & takes notes....".